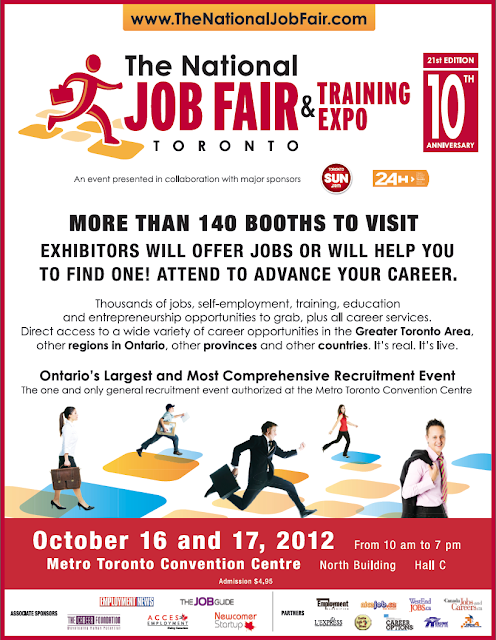 The fall of 2012 edition of The National Job Fair & Training Expo will be held on October 16 and 17 (Tuesday and Wednesday) from 10am to 7pm. For this 21st edition, more than 500 recruiters, career specialists and admission officers will offer jobs or will help you to find one through employment and career services, career training or education programs. The exhibit hall should showcase some 140 booths to offer thousands of employment and career opportunities. It will be held at the Metro Toronto Convention Centre in downtown Toronto to be accessible to as many individuals as possible from the Greater Toronto Area and outlying regions. The National Job Fair & Training Expo is a reputable event for a decade. It brings to candidates more job, training, education, self-employment, career services and entrepreneurship opportunities than any other event. Visitors will find a wide range of reputable, dynamic and quality organizations from a wide variety of sectors under one roof, with something to offer everyone. The fair promotes the hiring and career development of all individuals. The year 2012 marks the 10th anniversary of The National Job Fair & Training Expo in Toronto. This is an outstanding and rare highlight in the field of recruitment events in Canada.